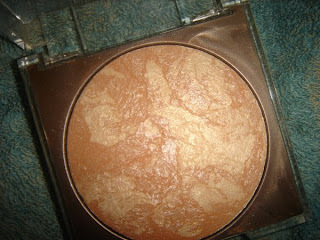 Today I am talking about one of my fav highlighters. . . 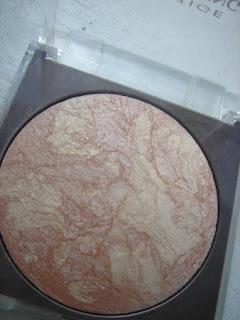 I spent such a long time searching for the perfect highlighter and a while ago now I saw on Lollipop26's blog that she has purchased the Prestige Skin Loving Mineral Bronzer from Boots, So the next time I was in boots I picked it up. It cost about £8.99 and they have three colours, two are bronzer type colours, but one of them is called pure shimmer and is exactly that! .. My initial reaction was that it looked very similar to a MSF from MAC which I had been dying to get one of for ages. It is dome shaped and you get a lot of product for your money in my opinion. I just use it on my cheeks and cheekbones for a nice shimmery highlight. It is not overly shimmery, although it can be built up and it is not chunky or glittery either which is a plus because I hate fallout of huge chunks of glitter all over the place! It looks so pretty too and has lovely veining running through it with some peachy and golden tones. 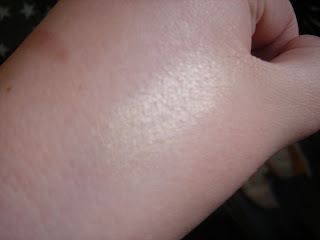 Here are some swatches on my hand, one with flash, one without. All in all I would say that this is an amazing product and I do not regret buying it one little bit, and I will certainly repurchase it. I love it! 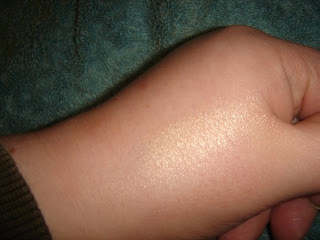 I really want to get this - the "bronzed glow" is a look that I just do not possess the necessary products to achieve.